Are you considering trapping pigeons around your home, barn, business or property? Good news.....it's actually pretty easy and you can do it yourself without hiring an expensive professional. Pigeons have adapted quite well to living in urban environments with humans and can gather in flocks by the hundreds quickly becoming a nuisance. 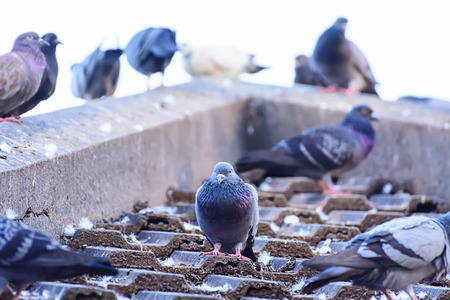 In addition, pigeons carry diseases like salmonella and their nests carry unwelcome bugs like bedbugs and other insects that carry diseases. They can also damage buildings, roofs and other structures creating expensive repairs. 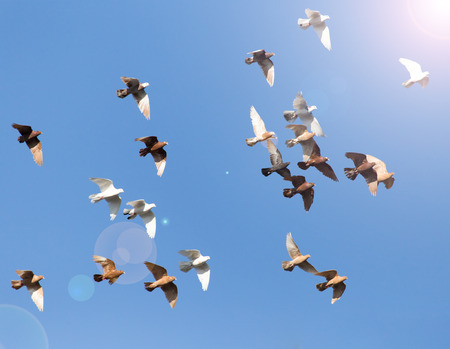 If your property has been bombarded by hordes of pigeons, you are probably looking for all the information you can get on controlling the damage and getting rid of your unwelcome bird pests. Fortunately, trapping the birds does not take rocket science or involve hurting them. A couple of pigeons visiting your property every now and then might not have you breaking out into a sweat to get rid of them. However, once their population grows there are a few basic steps you can take to keep your property pigeon-free in a humane way. Clean up any food trash laying around the property and keep the lids on all garbage receptacles closed. If you feed other types of birds at a bird feeder, make sure to clean up any dropped seed off the ground where the pigeons are likely to feed. Otherwise, stop feeding the birds until you get your pigeon problem under control. Install bird spikes, electric track or bird netting on your roof and ledges which will prevent the birds from landing or building nests. These devices make your home or building less comfortable for the pigeons to land or roost on, encouraging them to go somewhere else. Keep your bushes properly trimmed and maintained so the pigeons do not have a place to roost or hang out. Scare the pigeons away by using scare objects shaped like owls or hawks and install them around your property. So the birds do not get used to a stationary object, tie the scare object on string so it can move around in the wind. If the repelling actions don't seem to make a dent in your pigeon population, you have no choice but to trap and relocate the birds. However, you need to follow some pre-trapping steps to make sure the birds feel safe enough to enter the trap. There are humane traps designed specifically for pigeons, which are large cages with a door that will trap the pigeons without harming them. The inexpensive traps will catch single or multiple birds if used correctly. 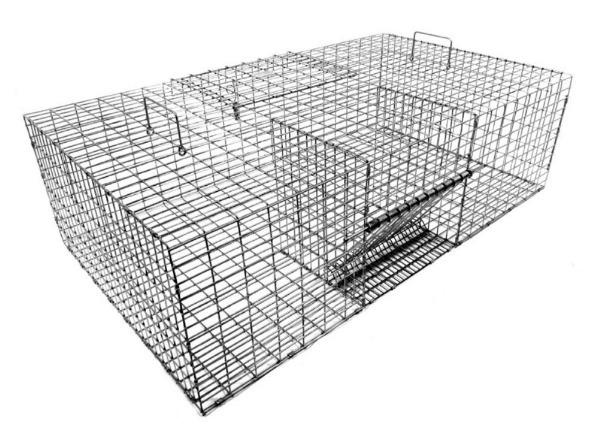 You can usually locate pigeon traps at home improvement and gardening stores. Or you can simply order one online, such as the trap listed above. Don't forget, pigeons are intelligent animals so you’ll need to be smarter than the average bird to have success in your trapping efforts. With a little patience and effort, you should be seeing pigeons in your traps in no time. Your first step in trapping pigeons is to get the birds used to you and the designated feeding area and feel safe. Spread some cracked corn on the ground and allow the birds to feed undisturbed for a few days before setting out the trap. After the birds are used to feeding in the area, place the trap out with the door open with some feed inside. You want the birds to get used to the new object placed in their feeding site. Continue to spread the corn around and inside the trap allowing the birds to feed for several days. Once you have a nice population of pigeons feeding at the site, bait and set the trap. You can keep some of the birds in the trap with fresh food to lure more of their friends to the area for trapping. Before you know it, you should have captured a nice flock of birds that you can relocate and set the trap out again. Once your efforts in trapping pigeons have paid off, you will want to relocate the birds. Remember, pigeons are smart and can find their way back to preferred locations from far away, so you do not want to release the pigeons close to your home. This is especially true if the birds have started roosting at your home. Pack up your trapped birds and drive them far away from your house when releasing them. Then, cross your fingers and hope they don't return back to your home. Since pigeons have a remarkable ability to find their way home (such as your house) their is a distinct possibility they will return, no matter how far away you take them. If relocation doesn't work, the only other option is to dispatch the birds if you want to keep them from returning. Combining preventative measures with trapping should get your pigeon problem under control after a few weeks. However, you might have to continue your repelling actions for weeks or months to get large populations under control, especially if they have marked your home as a preferred location. Remember, pigeons are intelligent and used to humans, so do not be surprised if they seem to ignore your efforts at first. Do not give up because continued efforts in repelling and trapping will eventually pay off and before long your landscape should be pigeon-free.